Note: I have retired from teaching and advising students but am still active in research and writing. The best way to contact me is via email. If I do not respond in a timely fashion it is because I have nothing useful or definite to say. This book, published in 2002, is a beginning graduate-level textbook on algebraic topology from a fairly classical point of view. To find out more or to download it in electronic form, follow this link to the download page. This unfinished book is intended to be a fairly short introduction to topological K-theory, starting with the necessary background material on vector bundles and including also basic material on characteristic classes. For further information or to download the part of the book that is written, go to the download page. I have now returned to an earlier plan of having this material be an extra chapter of the Algebraic Topology book, rather than a separate book. The current version of this chapter is here. Its main focus is the Serre spectral sequence and its applications, but there is also some coverage of the Adams spectral sequence and, more briefly, a few other spectral sequences. In case you would like to see the older version that was planned as a separate book, this can be found on this page. This is intended to be an undergraduate textbook presenting a somewhat geometrically-flavored introduction to elementary number theory. See the download page for more information and to get a pdf file of the part of the book that has been written so far. "Moduli spaces of circle packings" (with William Thurston). pdf file (14 pages) posted March 2018. This is a partial write-up of a project that Bill and I worked on in 2008. The paper contains two theorems, but the proof of one of them is not complete. The remaining details could have been easily filled in by Bill, and my hope is that someone else will be able to do this now. "The Kirby torus trick for surfaces". pdf file (9 pages) posted January 2014. This is an expository account of two classical theorems in surface topology: Topological surfaces have unique smooth structures, and homeomorphisms of smooth surfaces are isotopic to diffeomorphisms. With the torus trick, almost no point-set topology is needed for the proofs. "A short exposition of the Madsen-Weiss theorem". pdf file (43 pages). This version posted February 2014. Appendices have been added giving the calculation of the stable rational homology, a proof of the Group Completion Theorem, and the Cerf-Gramain proof that the diffeomorphism groups of most surfaces have contractible components. "Tethers and homology stability for surfaces" (with Karen Vogtmann). Alg. & Geom. 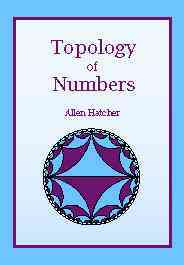 Topology 17 (2017), 1871-1916. pdf file. "Assembling homology classes in automorphism groups of free groups" (with Jim Conant, Martin Kassabov, and Karen Vogtmann). Commentarii Math. Helv. 91 (2016), 751-806. pdf file. "Stabilization for mapping class groups of 3-manifolds" (with Nathalie Wahl). Duke Math. J. 155 (2010), 205-269. Here is a pdf file of the version from October 2009 which is in some ways preferable to the published version. "Stabilization for the automorphisms of free groups with boundaries" (with Nathalie Wahl). Geometry and Topology 9 (2005), 1295-1336. pdf file. See also the short Erratum that refers to our second paper (listed above) for details. "Pants decompositions of surfaces" pdf file. This is a 12-page excerpt from a joint paper with Pierre Lochak and Leila Schneps,"On the Teichmuller Tower of Mapping Class Groups," J. reine angew. Math. 521 (2000), 1-24. "Cerf theory for graphs" (with Karen Vogtmann), J. London Math Soc. 58 (1998), 633-655. pdf file There is also a short Addendum clarifying the proof of Proposition 6.2, written in 2018. "Triangulations of surfaces". The original version of this was published in Topology and its Applications in 1991. pdf file (7 pages). "On the diffeomorphism group of S^1 x S^2". This is a revision, written in 2003, of a paper originally published in the AMS Proceedings in 1981. pdf file (6 pages). "Boundary curves of incompressible surfaces". A rewritten version of a paper originally published in 1982 in the Pacific Journal. pdf file (5 pages). "Topological moduli spaces of knots". This is also unfinished, but the aim is to describe the homotopy types of the components of the space of all knots in the 3-sphere. pdf file (12 pages) This version posted October, 2002. "The cyclic cycle complex of a surface". pdf file (January 2008, 7 pages). This has been largely superseded by section 2 of the paper "Generating the Torelli group" with Dan Margalit listed above, which gives an exposition of the construction of Bestvina-Bux-Margalit that was the inspiration for "the cyclic cycle complex". Later I realized that the cell complex constructed by BBM has a canonical triangulation which makes it a subcomplex of the cyclic cycle complex, so for most purposes it is probably better to use the smaller BBM complex. "Bianchi orbifolds of small discriminant" pdf file (6 pages). This is a brief report I wrote in 1983 but never published. Here are some Pictures of Bianchi orbifolds. "Curves on the 4-punctured sphere: 31 Charts" (with Bill Floyd). This is an unpublished paper from around 1980 that you can download as a pdf file (3.8MB) that was made by scanning the original typescript. You can also view it onscreen here. Stable homology of spaces of graphs. A talk at Banff in December 2012 about an analog of the Madsen-Weiss theorem for certain 3-manifolds. There is also an earlier version of this talk given at Stanford in July 2012. A 50-year view of diffeomorphism groups. A talk at the 50th Cornell Topology Festival in May 2012 sketching some highlights of what's known about the homotopy types of diffeomorphism groups of smooth manifolds. A full history would of course be impossible in an hour talk. Stable homology by scanning: Variations on a theorem of Galatius. A talk at Luminy in June 2010 outlining the current simplified form of the proof of Galatius' theorem on the stable homology of Aut(F_n), with comments on how the Madsen-Weiss theorem follows similarly, as do a couple analogs in dimension three involving handlebodies. The classification of 3-manifolds -- a brief survey. This is a written version (11 pages) of an expository talk at the 2004 Cornell Topology Festival. Also available is a pdf file of the transparencies for the talk itself.